Good Riddance & Dead To Me added to San Francisco Fat Wrecked For 25 Years! Happy Monday! 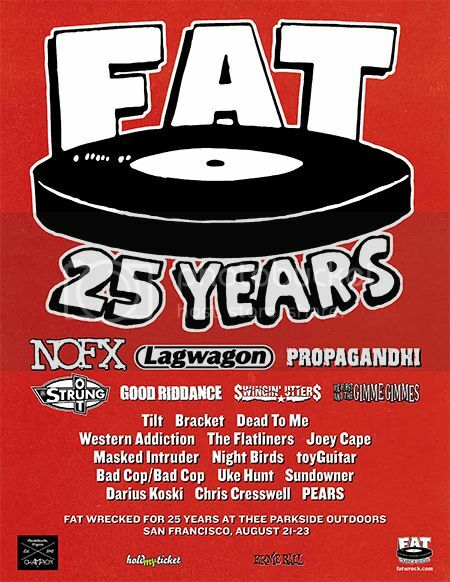 Today we’re stoked to announce that Good Riddance and Dead To Me will be joining our Fat Wrecked for 25 Years blow out weekend in San Francisco! We also added the perk of being able to purchase a two-day pass for the Saturday and Sunday shows, instead of having to buy each day individually. Get your pass here. To celebrate our anniversary, New Noise Magazine put us on the cover of their new issue! Additionally, if you snag a copy early, you can enjoy a special one-off Fat comp called Fat Gets Heavier, featuring AVAIL, Sick of it All, Night Birds and lots more, so don’t delay, get your heavy on here!